OK, this was actually reported a while ago, but I only recently read of plans by Atlas Film Corporation to build a studio in Newton — in Cold Spring Park, no less. The company acquired rights to a significant part of Cold Spring Park — encompassing the current dog park, lower fields, and what’s now a few blocks of nearby homes — for a whopping $26,166. The plans were implemented in 1916-17. Over the next several years, Atlas made silent films, including The Place of the Honeymoons (vote for it on IMDB). I understand that the studio filmed silent westerns, too, right here in Cold Spring Park. One of the studio’s producers, Frank Howard, was the first person to open a movie theater in Boston. Unfortunately, although this story is true, it seems that no copies of the films made by Atlas can be found today. 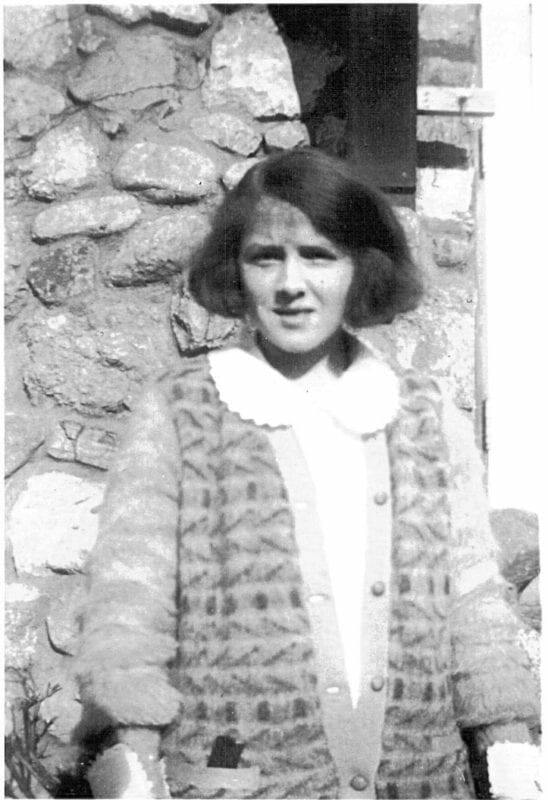 Hellen (Sheehan) King, c. 1922-23, standing in front of Atlas Film Corp. studio. UPDATE: An alert reader responds with a photo! Here is a photo of Helen (Sheehan) King standing in front of the Atlas Film Corp. studio building. It was taken around 1922-23, when she was about 16. Her daughter, Sally (King) McClellan, sent it to me after discovering this blog post during her family history research. In her comment below, Sally wrote, “My mother and aunt were extras in the movies, as was a neighborhood pal and later Mayor of Newton, Howard Whitemore.” Her comment includes many other historic details. From 1900 to 1996, five generations of Sally’s family lived at 5 Selden Street (on the 2013 map above, it’s the western-most blue house bordering the south side of the aqueduct). Bruce. This is fascinating. Thanks for posting this. I grew up with many elders who lived in Newton Highlands near the turn of the last century. I never recall any of them referencing a film studio, let alone one that filmed westerns at Cold Springs Park. Cowboys at Cold Springs is something I would have remembered. An elderly friend (who has since passed away) told me that his mother had worked in one of the Atlas Film productions. He lived in Newton within a mile of where the studio was located. He told me that in 1950 he met a director who had worked at the studio who told him that Stan Laurel had made films there. This is still unconfirmed beyond this one statement. It’s a bit hard to follow up on an anonymous blogger quoting a since-deceased friend quoting a director he met 63 years ago, but there you have it. We have a 1929 City of Newton Atlas page for this area, and it shows that only 12 years after the creation of the first map Bruce posted, Plymouth and Kingston Streets were already there and were lined with the houses that exist today. By 1929 Atlas still had 1.1 acres of property surrounding the building that shows in red along Alden (now Chatham) Street. We know a long-time resident of the neighborhood who says when she first moved here, some of her neighbors reported being extras in some of the films made by Atlas when they were kids. She also reported that the big house on Endicott with the red roof tiles was owned by the owner of the Studio. This house would have been almost immediately across the aquaduct from the main studio building. The Cold Springs Cowboys sounds like a western swing band. “An anonymous blogger quoting a since deceased friend quoting a director he met 63 years ago” sounds like a rock solid source to me. From here on out, I’ll be treating that tidbit as an uncontroversial fact from an unimpeachable source. Great post Bruce .. . and I loved the then/now maps. 1. Most of the former Atlas land that was not built on by 1929 was owned by “Haynes and Hernandez, Inc.” A quick search indicates that they were 1920s Newton land developers. I wonder if they bought the whole parcel from Atlas and then built Kingston Road and the Plymouth Rd. continuation? 2. On the 1929 map, a name is printed on each individual parcel of property. Probably 90% of the names are woman. I imagine listing property in a wife’s name may have had something to do with insurance or other practices of the day. Does anyone know more about what was behind this practice? 3. The name on the property that was reported to be owned by the studio owner is “Minnie McL Guild.” Does this name ring a bell for any V14 readers? 1. Haynes and Hernandez did indeed purchase the land from Atlas in Oct. 1925, as stated in this 1938 legal hassle involving two landowners trying to block the connection of Puritan Rd to Plymouth Rd. The landowners lived at the top of Puritan (then George) Street, which at the time was covered with trees and brush, and they claimed they bought their land under the expectation that it would be on a dead-end street (despite the deed saying otherwise). They lost. 2. Maybe it had to do with estate law. 3. The president of Atlas Film back in 1916 was Leon Dadmun, “the well-known Boston photographer and moving picture man,” according to the article in first link of this post. On the 1917 map shown above, the lot you mentioned was owned by Henry F. Guild. He was very likely the same person as photographer Henry F. Guild. It seems that several of Atlas Film’s 10 owners were photographers, and he could have been one of them. In the 1910 census, Minnie M. Guild was married to Henry F. Guild, living in Ward 5, probably in that Endicott Street house. By the 1920 census, she was widowed. By 1935 she had moved to the Stone Institute on Elliot Street. I was raised in my grandfather’s, my parents and then my home on Selden St., located diagonally across the aquaduct from the Atlas Studio. My family lived there from 1900 to 1996. My mother and aunt were extras in the movies as was a neighborhood pal and later Mayor of Newton, Howard Whitemore,and have a picture of my mother standing in front of the studio. No markings to prove it, only is what she told me. I remember here telling me about a movie that was shot at Crystal Lake. Family lore is that my grandfather’s rooster was at least for a time, the Studio logo. I remember my mum telling me that Mae Marsh was one of the stars of the studio at the time. Don’t remember reference to Stan Laural I ran into your comments as I am researching the studio as part of the history of my maternal grandfather’s immigration from Donegal, Ireland to our house at 5 Selden St. A family homestead to five generations of our family. Our home and lot next door were at one time owned by George Angier, who, among other things, was Newton alderman. My grandfather was caretaker of his Waban estate on Pine Ridge Rd. The Angier School was named in memory of his Son, Albert who was lost in WWI, A book “On the Field of Honor,” printed in l920 A beautifully bound book, it contains a collection of letters about his life and and two of his fellow Harvard undergratuates who also their lives in that Great Cause. I would love to hear back from any of the seven previous respondents. I’ve just updated this year-old post with a photo sent to me by a former Newton resident whose mother and aunt were extras in films made by Atlas Film Corp. in Cold Spring Park. Thanks, Sally (King) McLellan! This is fascinating! Thanks Bruce. Didn’t you draft some sort of book on characers from Newton? Is that still happening? If so, can you update us?? Yes, I’m still working on “Legendary Locals of Newton.” If all goes according to plan, I’ll be wrapping it up in the next month and it will come out in the fall. I’m pretty well covered on the historical front. Most of what I’m writing about and gathering photos for now is the last 30 years or so. Thanks for asking! @Sally (King) McLellan. We were lifelong friends with the Whitmore Family. I’m certain the Howard Whitmore you are referring to was Howard Jr., who was Mayor of Newton from the late 50’s to the mid-60’s. He never mentioned Atlas Films or any role he had in any of the productions at Cold Springs. An interesting aside. We have a dvd of old 8 mm home movies my folks took when my sister Joanne and I were kids. It includes a black and white film from the early 50’s of one of the “fathers and sons” baseball games we used to periodically play at Cold Springs. It pictures Mayor Whitmore pitching and my dad at shortstop. @Sally (King) McClellan. Now I’m piecing some pictures together of who you were. I knew the King Family on Selden Street and I think that you and I may have played games of “Capture the Flag” with Howard Whitmore’s son on that aqueduct behind your house. We knew it then as the Green Woods or Pine Woods. Maybe it’s just a coincidence, but our Ward Alderman John Rice lives right next store to your old house. His grandparents also came over from Donegal, probably about the same time that your family did. I came across a newspaper article from 1934 , relative to a massive fire at a film studio in Newton, MA. Will look up the article with the date of this event. Around 1916, Atlas Film Studios acquired much of Old Cold Spring Park, built a studio near the end of Alden St. (now 35-41 Chatham Rd.) and produced mainly westerns but also The Place of the Honeymoons in 1920. One of their producers, Frank Howard, became a minor mogul in the film industry, opened the first movie theatre in Boston, and began the Boston Film Exchange. Atlas Films employed locals as extras, including eventual Recreation Commission member and mayor (1954-59) Howard Whitmore. I am writing in 2018 and am a part of Newton Conservators looking for more complete information about the Atlas Film company. Does anyone know of books or articles written about the company and the films it produced? I have tried various film magazine sources but with no success. Thanks for any help and ideas. And now that corner of Cold Spring Park is about to become a film location again, as the site of the murder in “Defending Jacob,” based on the book by Newton Highlands resident, William Landay.